Following the critical and sold-out success of My Kitchen Fools and Saturday Night Fever, Matt Byrne Media is back with another major hit - Stephen Nye's 'politically incorrect riot' Men Behaving Badly! 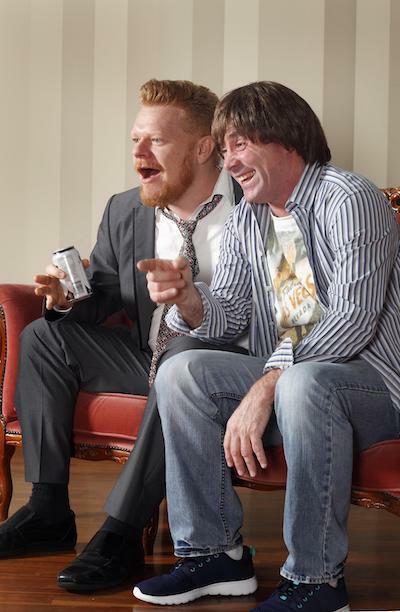 Men Behaving Badly will play at Holden Street Theatres for a strictly limited season, from 3 to 21 October 2017. Tickets are now on sale. Based on the award-winning 1990s British sitcom, Men Behaving Badly, Matt Byrne is delighted to have received permission from author Stephen Nye to present four of the most outrageous and funniest episodes - 'Bed', 'Marriage', 'Drink' and 'Sofa'. "Men Behaving Badly came along when political correctness was in full swing and helped swing the pendulum back the other way," Byrne said. "What is amazing about this side-splitting show wasn't just the male support for blokes being dreadful blokes, but the number of women who found it hilarious." In Men Behaving Badly, Gary and Tony are two London-based beer-guzzling flatmates, revelling in a second childhood, hours of TV, and mindless talks about women - the kind of behaviour that puts their relationships in jeopardy with Dorothy (Gary's long-suffering nurse girlfriend) and Deborah (Tony's blonde ambition in the flat above). Director/Designer Byrne said "Gary and Tony are complete lager louts with few redeeming qualities and their women Dorothy and Deborah usually come out on top. The great mystery is they somehow stayed together, for six triumphant seasons, maybe there's a message there somewhere, but you'll be laughing too hard to care." 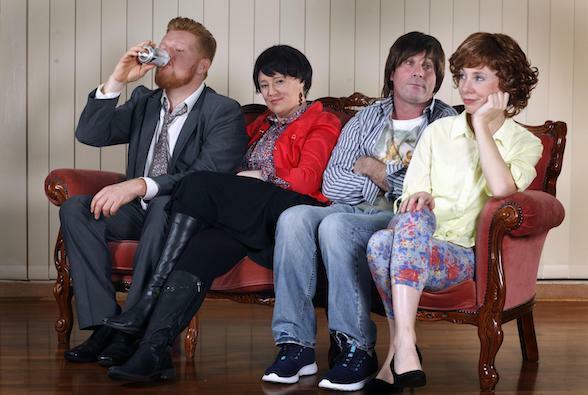 The Matt Byrne Media production will feature Rohan Watts as Gary, Georgia Stockham as Dorothy, Brendan Cooney as Tony and Cheryl Douglas as Deborah, with John Matsen as George and Heather Riley as Anthea, and contributions by Bec Mason, Heather Crawford, Nick Kennett, Chris Stansfield and Niki Martin, with Byrne as the hotel proprietor Les. 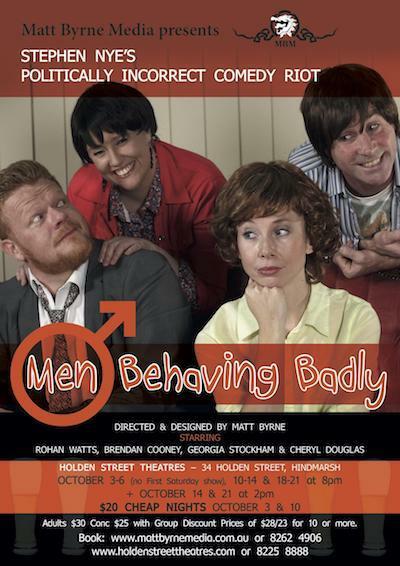 Tickets are now on sale for Men Behaving Badly at Holden Street Theatres, 34 Holden Street, Hindmarsh. Admission is Adults $30 and Concessions $25 with Group Concessions for 10 or more. The Tuesday shows on October 3 (Preview) and October 10, are both $20 Cheap Nights. When: Oct 3-6, 10-14 & 18-21 at 8 p.m. Oct 14 & 21 at 2 p.m.